Jeez...you are NO slacker compared to me ! I've hardly updated my blog... I get totally overwhelmed during the holidays. no new food around here! WHEW......OK.......OFF TO COOK. NO REALLY. 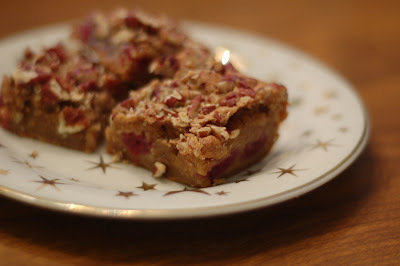 Love the blondies but am totally indebted to you for the tip on printable recipes. I don't want to alienate the few readers I've managed to attract! OH! YUM!! This sounds great. great idea to inclue a printable version. I have to learn how to do this. do you think I could sub the raspberries with blackberries? cuz that's all I have in my freezer. I really appreciate being able to print out the recipe now I can take it to the kitchen and try it.